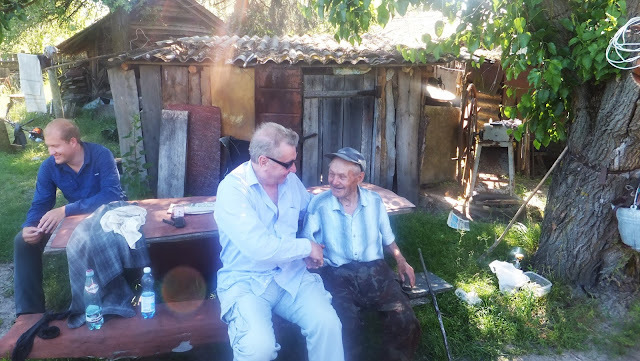 When Mike asked me to interview a long standing client of Scott’s Travel, Jeffery Best, about his recent trip to Chernobyl I was unsure as to what to expect. Upon arrival at his home in Southgate he immediately whisk me upstairs…I was in for a surprise. Jeff, a full time pattern maker for the likes of Ted Baker and many other high street brands, showed me his studio. Displayed on the walls are photographs of his many trips abroad (booked with Scott’s Travel) alongside his Equity Acting certificate. When he is not making the next on trend shirt he doubles up as a wedding toastmaster! More recently Jeff was looking for something a little different and decided to book a place on an escorted tour around Chernobyl (Ukraine). Yes the place of The Chernobyl disaster where a catastrophic nuclear accident occurred on 26 April 1986 at the Chernobyl Nuclear Power Plant in the city of Pripyat, then located in the Ukrainian Soviet Socialist Republic of the Soviet Union (USSR). The explosion and fire released large quantities of radioactive particles into the atmosphere, which spread over much of the western USSR and Europe. The Russian’s had originally down played the disaster but many believe that it was in fact the start of the end of the Soviet Union. Fewer than six years elapsed between the meltdown at Chernobyl and the formal dissolution of the Soviet Union—six years marked by suspicion of government, dissatisfaction with public safety, and demands for greater transparency. Could Chernobyl have caused the first, most fundamental crack in the Soviet state and led to its collapse? I was curious to know why Jeff was keen to visit the disaster site to which he replied. “Because it’s there”. Jeff flew into Kiev where he spent the night. He was collected at 8am the following morning by his charming tour guides. After a 2 hour coach drive the group of 6 reached the seclusion zone, roughly the size of Enfield, where they had to present their passports before entry. The first day of their tour took the group to abandoned schools, summer camps and buildings. Each member of the party were given a Geiger counter, a consistently clicking reminder of their present danger. The reactor itself is on the verge of being in-cased in the World’s largest moving man made object on earth, an impressive sarcophagus. With the assistance of scientists from America, Japan and the Far East they hope to successfully dismantle what remains of the nuclear reactor. Chernobyl is now considered clean and on the second day of the tour Jeff was introduced to Ivan Ivanovitch an 80 year old “returner”. Originally evacuated by the Government after the disaster Ivan felt that the new village was more exposed to the danger of the after affects and he soon returned to his small holding where he continues to grow vegetables, although he is not allowed to sell them. Every month his water and ground is tested to ensure that it is safe. Jeff with Ivan a "returner"
The 2 day tour is not for the faint hearted with temperatures exceeding 30 degrees, two solid days on your feet and not the most luxurious accommodation whilst in the seclusion zone. However for those with a thirst for knowledge it offers an exclusive insight into history and all for around £600 per person. Heathrow to Kiev – One night in Kiev, followed by one night in the seclusion zone and a further night in Kiev before flying home. New York, Marrakesh (Morocco), Cork (Ireland), Malta & Gozo, Cairo (Egypt), Moscow, Cyprus, Rome, Isle-o-Mann, Jordan, Athens, Amsterdam, Kenya, Iceland, Florida, Canada, Istanbul, Croatia, Oslo, Albania, Jerusalem, Prague and Transylvania (Rumania). This is not science fiction, and the true reality of our world. I've been there once http://touristclub.kiev.ua/tours/one-day-tour-to-chernobyl.html. This is a very quiet place, which shows and teaches us not to make mistakes, because our children will pay for them. Be on the alert, when you work with the peaceful atom.